There’s an often-repeated number in studies on expertise: it takes 10,000 hours of deliberate practice in order to build a skill to mastery. Generously including quick blog posts as part of this practice, assuming that I’ve maintained a similar pace since around 2003, neglecting the fact that real writing involves a whole lot more rewriting (which I tend to do out of forgetfulness rather than deliberate improvement), and ignoring the assigned writing I slogged through in school (or the countless e-mails I dash off), the calculations show that I’ll probably be inching closer to awesomeness… oh… when I’m 57 or so. I know life doesn’t quite work out like that, but let’s pretend for the sake of calculation. It doesn’t actually look half-bad, you know. If I can get a decade or two of great writing out right around the time I should have tons of experiences to write about, that should be fine. Of course, with the unreliability of memory (both mine and the computer’s), I’ll just have to hope my blog will survive the years. And if I turn out to be a passably good writer who can package up what I’ve learned and turn it over to the next generation of young whippersnappers, then that’s great. Don’t need to win any awards. On a similar note, I logged 198 hours drawing last year. 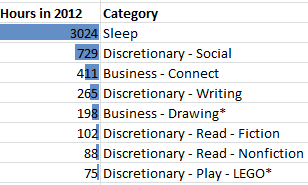 This does not include the times that I filed drawing under “Business – Plan” or “Personal – Plan” instead. Even less revision going on over here, but I’m working on ways to improve that, and other ways to increase the proportion of writing and drawing in my life. Malcolm Gladwell’s Outliers: The Story of Success broke down that 10,000 hours into around 10 years of daily 3-hour practices. I have spent a ton of time coding. I’ve been coding since I was six or so, and I worked on quite a few web development engagements at IBM. I’m still nowhere near “master” level. I can point to lots and lots and lots of people who are way better than I am. I have fun with it, though. I can make stuff happen. It’s good to remember that invisibly sunk time, the accumulation of experience over years. That way, I don’t get frustrated about drawing if it feels less natural than coding, and I can see all this writing as building a skill step by step. Thank goodness for visible progress. Hooray for a blog that lets me go back in time! Compared to a year ago, I draw so much more than I used to. I feel a little more organized and coherent as a writer – headings for my paragraphs, an index for my posts. I still don’t have the deft interweaving of personal story and insight I envy in Penelope Trunk’s blog or the lyrical geekiness of Mel Chua (no relation), but I’m growing into my own style. I think it would be fascinating to have 10+ years of time data. It’ll be interesting to see how I change things along the way. Not that quantity of time controls everything, but it’s fun to ask questions and realize that the composition of your time doesn’t always match up to what you think it is. Then you can tweak it. So that’s where all the time went!